Are you familiar with the Shewman Burger served at Scotty’s Brewhouse? Every burger joint has a bacon cheeseburger (generally my pick for a cheat meal! ), and jalapenos aren’t totally out of the norm, but what makes the Shewman unique is the smear of peanut butter oozing out just above the bottom bun. To someone ambivalent at best to peanut butter, I was admittedly a bit put off by this concept initially; however, I tried it years ago and can’t help loving it. A couple years ago, it occurred to me – why couldn’t I make a meltdown-friendly version?! Generally, I’ll eat this burger without cheese of course, but I’d venture to say the ability to treat oneself to a slice of Go Veggie! vegan cheddar cheese once in a great while pushes this mock-burger over the top. Using your hands, incorporate the egg into the meat as a binder. If you’d like to add spices, or finely diced veggies (carrots, onions, bell pepper, etc. easily sneak veggies into the burger), do so as well. Divide and form into 3-4 patties. Grill or cook in a skillet with the turkey bacon. The turkey bacon will cook faster so keep your eye on it. 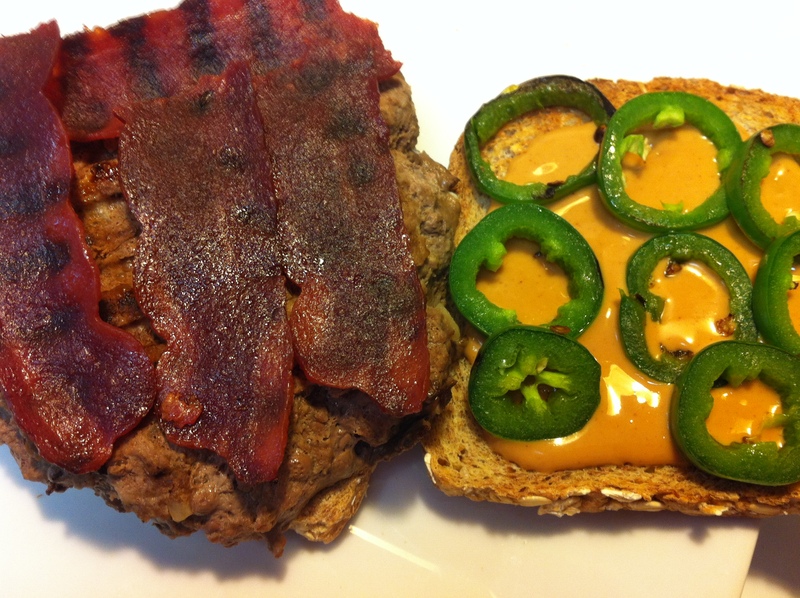 While the meat cooks, get Ezekiel bread toasting (always better toasted) and prep jalapenos as needed. I used a fresh jalapeno so I sliced it and sautéed it in a pan. Remove seeds to minimize heat – I like spicy but my fresh pepper was hot so I’m glad I omitted seeds! Ensure your peanut butter is smooth and spreadable (may need to microwave it if you keep it in the fridge). Vegan cheese doesn’t melt as easily so I like to put it on the nearly cooked burger and let it continue to grill or cover a skillet to speed up the process. Once everything is cooked, simply assemble. Smear the pb on your bottom bread/bun. If it seems like it’ll be too messy, divide the pb onto each slice of bread. 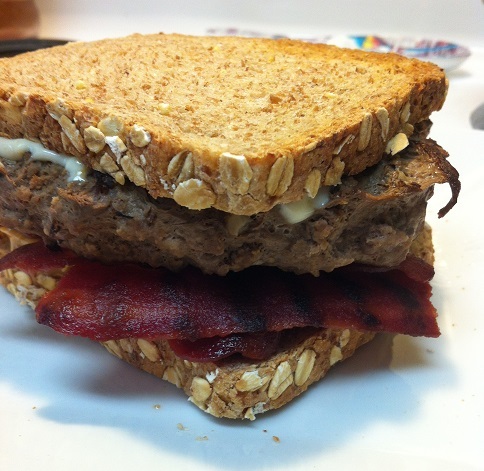 Add the burger with optional cheese, turkey bacon, and jalapenos. Certainly not as greasy or indulgent as the real thing, but an impressive at-home and healthier version of this incredible burger! Feast like Scotty’s at home, feast on the Shewman, and as always…FEAST ON!! !